I think there is a lot of bandwagon jumping Wegerle...wanting to fit in with the general opinion and not wanting to be different. It only takes one person to speak out against the masses and others will follow suit. Bet there are others who quite like Harry who will chirp up now. Until then, you are correct, we are in a minority. Nice one. Seems to me it's "the masses" that like him. The media certainly do, as he's always ready with a quote and a story, making their job easy. Fans whose clubs he's actually managed often have a rather different take. Not to mention HMRC. By masses, I was really referring to the majority on this forum, rather than in general. I agree the media do like him but that is because he is a character and not run of the mill I would say. Correct me if im wrong but wasn't Harry manager of QPR when promotion was gained v Derby in play off final in 2014? So, why the Harry hating on here or is it just the done thing...a bit like its the done thing to hate Chelsea or Fulham as a QPR supporter? It's all semantics really I suppose. Strong dislike is a better way of putting it. That's it in a nutshell generally speaking 2's. Agree also with BG on the Man U thing, otherwise no strong feelings football wise to other clubs, players etc. Without looking it up in any way shape or form, could you honestly name our starting line up from that day? I know I would struggle to name more than 7-8 of them and I was there. The 66-67 team I will never forget the starting line up, THAT was my finest day of supporting the R's. I quite agree. The 66/67team and the one ten years later are etched into our psyche. They were wonderful football teams that bore comparison with any you could mention. The side that won at Wembley under Arry was expensively assembled and yet completely outplayed by Derby. We won via a mishit cross that was miscontrolled by a defender and put away with some aplomb by Bobby Z. OK our team played with great guts and composure that day and it was a great day for the fans I admit. Exactly that, IMO it was fairly close wrt chances etc. up until Gary O'Neil took George Russell out and the red card that followed, after that it was all backs to the wall defending and hoping something would break our way. The thought that Junior would out muscle Buxton and put him on his arse probably wouldn't have figured in anyone's hopes but to follow it up with a poor cross which Keogh directed straight onto Zamora's favoured foot is a fantasy . It was still a great couple of hours afterwards though, as was the hours after Clem announced to the waiting crowds in SA road that there would be no points deducted before the Leeds game, especially outside the Coningham/ Adelaide with cars, buses and taxis all honking their horns and the police taking a very lenient view to public drinking LOL. 82 and 86 were big disappointments as I was at both finals. To revisit this tawdry subject. 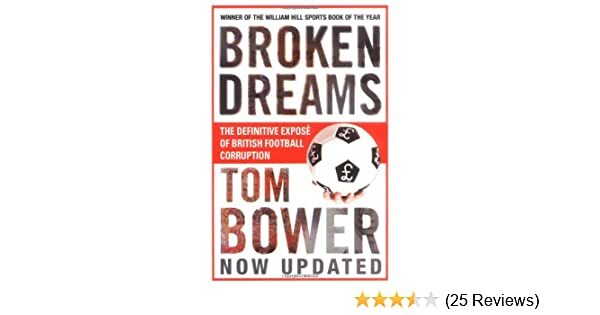 There is a book called Broken Dreams by Tom Bower all about corruption and greed in football in this country. It is a truly ening read for any football fan. Terry Venables and Harry Redknapp both get chapters all to themselves and neither make comfortable reading. I would strongly suggest that posters on here read it and it may help give understanding to some of the diabolical things that we have all seen in football since we began following the game. The fact that the author has not received a single writ over his book lends a lot of weight to the fact that he has got his details spot on. Football at the top level is awash with money nowadays: no point in worrying about it because it's not going to change. Greedy individuals are attracted to the 'beautiful game' because of it as there is easy money to be made: just look at FIFA and the PFA. Redknapp and Venables are by no means the worst of them: there have been numerous individuals who have been caught, accused, implicated etc and I'm sure there are thousands of others we know nothing about. Have you read the book? It goes beyond simple greed. I would respectfully suggest that you read the book and then come back on here and tell us your feelings then. No I haven't read the book: it's not the football greed and corruption bible though so people should be able to express opinions on the subject without having read it. Perhaps you would take the opportunity, if presented, to read it as I feel certain that you would express a different opinion to the one you currently hold. It goes a long way to explaining the almost mystifying transfers that we have seen at QPR, and at nearly every other club, which have left fans scratching their heads in bemusement. The Javier Chevanton and Dellatore transfers in recent memory are just plain inexplicable from a first viewing but after reading the book it is a lot more apparent why clubs over the years have bought so many duds. Now confirmed he's part of the line up. Claims he's never seen the programme before.